Note this graph used data from Nov 2003, so it will quickly be out of date, but the exact same principle applied when 386s were the top-of-the-line, so what's important is the principle, not the data. Aim to buy where the return per dollar is maximized. 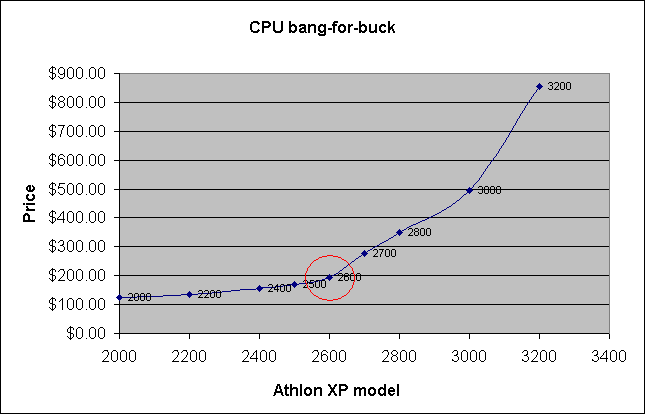 Buying CPUs using the bang-for-buck method would almost always result in buying the cheapest CPU. However for desktop machines this is usually the wrong answer, because the cheapest CPUs are at the end of their manufacturing lifecycle, and are becoming obsolete. Spending a little bit more gets a CPU that will last about 6 months longer. However, if you go for the best possible CPU, it gets very expensive. What to do? The best answer is that the sweet spot for these products happens right before that point of inflexion (shown above in red), and this is where you should buy. In practice, as a rough-and-ready rule, I used to upgrade when the clock-speed of the current sweet-spot CPU was roughly 3 times the speed of my current CPU. So for example my upgrade path was: Pentium 100 → Pentium-2 333 → Pentium-3 800 → Athlon XP 2600. This tended to happen roughly every 2.5 to 3 years in my experience. I personally found than an upgrade to a CPU below the 3-times rule does not feel worth it to me in terms of hassle or cost. Nowadays though the CPU clock-speed is no longer a useful indicator of performance, and a better indicator now is when performance is around 2 to 3 times faster in CPU benchmarking tests (e.g. compressing a file, performing audio encoding, etc). However, if your current system is running fine, then I suggest delaying your upgrade until you feel it's necessary - after all, why fix what ain't broken, especially when something cheaper and faster is always around the corner? There are some components that are can be unreliable (more so than other components), and when they are unreliable it wastes a lot of time and money. In my opinion, the components where quality matters most are motherboards, RAM, power supplies, and hard disks. I would always suggest paying extra for better-quality gear in these categories. ... because it hurts too much. Let others debug your hardware problems, so that you won't have to. Don't buy any hardware that has just been released. Don't buy niche hardware products. Buy mainstream hardware, that has been out in the market for at least 6 months, and which gets favourable reviews. If the vendor claims a driver is "in the works", then either buy another brand, or wait until the drivers have been released and commented upon favourably by others. If there are no drivers released already, and you don't want to wait, then look elsewhere. DJ Bernstein's inexpensive yet reliable Linux computer specs (gets updated occasionally). 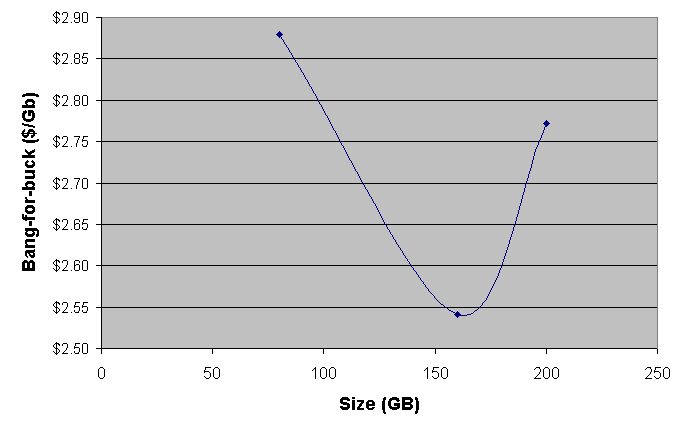 Graphs of storage cost, hardware cost, and bandwidth cost, all versus time. If you're in Australia, want a desktop system, and will be running Windows, and are having difficultly workout out what bits to buy, then just work out how much you want to spend, then buy the parts on this list, pay the shop or your kid to assemble it or do it yourself, and you won't go far wrong. If you're running Linux, then use the same list, but check first whether the video card and motherboard are fully supported (refer to DJ Bernstein's list too via the link above). This page was last modified on 19 February 2008, at 05:04.